The Lumia 800, a Windows Phone that launched back in 2011 was taken into the depths in Oulu, Finland on Saturday. Kiiminki Egyptian Timo was diving and handed the Lumia 800 to a friend to take photos for the trip album. Unfortunately the ice broke and the friend (as well as the Windows Phone) fell into the water. One would immediately assume all is lost and a new smartphone will need to be purchased, but it booted up when recovered. The Lumia 800 was under the surface for some ten minutes, Timo reports. As soon as the device was retrieved, the SIM card was removed from the device and it was turned on a couple hours later after being allowed to dry out. To everyone's surprise, the Windows Phone actually booted up. The only issue with the device after its dip is the touch display doesn't quite carry out all entered commands, which renders a smartphone almost useless (unless you can put up with the main means of input not working correctly). Apart from that small problem, it's working flawlessly. 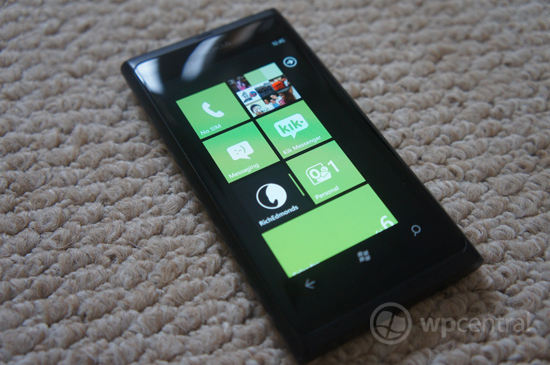 The older Windows Phone is a gem for Nokia as it paved the way for the Lumia 900 and the now popular Lumia 920. With the report from Tim, we can add more success stories to previous filings, including the experience by an owner where the Lumia 800 fell some three stories onto concrete and survived. It's interesting to see the Windows Phone take a snap underwater before seemingly turning off and being pulled out by the team. Should you own an old Lumia 800 (or any smartphone and electronic device), we don't recommend exposing the product to water. Source: Iltalehti.fi; thanks, E. Franssi, for the tip!